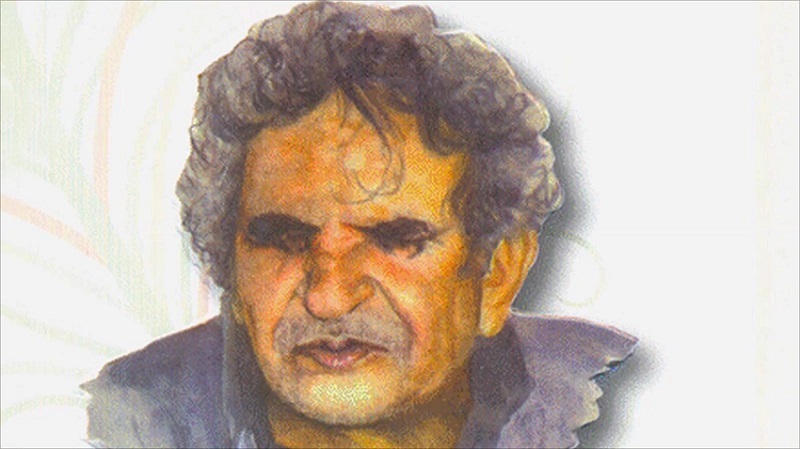 Born in 1929 in Baradoun village in Dhamar ذَمَار governorate (province), Abdullah Al-Baradouni عَبْدُ الله البَرَدُونِي is a renowned Yemeni poet شَاعِر and a literary critic نَاقِد. He lost his sight at the age of six due to smallpox which was widespread in Yemen at the time. Abdullah Al-Baradouni acquired his early education in his village, in al-mi‘lamah المِعْلَامَة, a small annex which was part of mosques in which children were primarily taught how read, write and recite the Holy Quran. Then he moved to another neighboring village where he continued his learning. Encouraged by his teacher, who moved to Dhamar City, Al-Baradouni moved along. Possessing an outstanding memory, he memorized the Holy Quran when he was seven years old. In 1949, after ten years in Dhamar City, he moved to Sana’a to continue his education. In Sana’a, Abdullah Al-Baradouni joined the some Halaqat, a seminar-like instructional sessions, in the Grand Mosque in Old Sana’a City. Outspoken and unhesitant to speak his mind, he was accused of agnosticism. As a result, he was imprisoned and moved to a jail in Dhamar. While in jail, he wrote a poem entitled ‘From a Knowledge Seeker to Imam Ahmed.’ The poem was sent to the Imam Ahmed in Sana’a. Fascinated by the imagery, rhyme, and wording of the poem, Imam Ahmed, went to Dhamar specifically to see the prisoner who wrote it. He ordered that Al-Baradouni be released from jail after serving eleven months. Al-Baradouni, then, returned to Sana’a in 1949. In Sana’a, he joined Dar-ul-Uloum دَارُ العُلُوم, a higher college for Arabic language and religious sciences. Al-Baradouni studied literature, Arabic grammar, and lexicography for four years. He graduated with a bachelor’s degree from Dar-ul-Uloum in 1953. Upon graduation, he was appointed in Dar-ul-Uloum as a sheikh, a title specific to teachers in religious institutions. Even though Al-Baradouni was more knowledgeable than his peers, he was never referred to as a master ‘alaamah عَلَّامَة, a grade higher than a sheikh. This could be due to his blindness or the way he dressed. It was a common practice that the master wore a turban, a wide robe, and a jambia, dagger in a wooden scabbard fastened with a thick belt. However, Al-Baradouni dressed differently; he neither put on a turban nor a jambia. Abdullah Al-Baradouni recounted that he was a very energetic and mischievous child. Losing his sight at an early age, he never felt what it meant to be blind. He constantly used to run, play, collide with walls, stumble over rocks and things and stand up. Every time he returned home, he had wounds because of falling, hitting a wall, or being kicked by a cow. Despite his blindness, he was so naughty, beating children up whenever he caught them. Getting off his grip, they threw stones at him and ran away. He never behaved like blind people do. Therefore, people had very little or no mercy and compassion towards him. After moving to Dhamar City, which is located in a lowland, his daily life was much easier compared to life in the village. He continued to be energetic and enthusiastic that he would fall into a cesspit, hit a newly constructed wall, or fall into a ditch. Everyone harshly shouted at him reprimanding him that he was blind and should be quite and stop running. He always had wounds in his body, especially in his foot, toes, and knees. ‘Everyone treated me harshly, except women,’ Al-Baradouni related. His mother loved him dearly, but his father did not care about him much. In the eyes of villagers, the value of a son is in how well he worked in the family land, and how much he was able to harvest and contributed to the family livelihood. The son must be a true fighter because he was born to be one and that he should kill or be killed. Possessing none, Al-Baradouni’s father viewed his as a burden and useless whenever there was a fight within the village or with a tribe from a neighboring village. ‘I was so daring that I would throw stones at people whenever there was a fight,’ Al-Baradouni recounted. ‘Not confessing that I am blind is my problem’ he added. Abdullah Al-Baradouni recounted in an interview in 1993 that the reason for having an encyclopedic memory of poetry is his blindness. Contrary to other noted Arab poets, like Bashar ben Burd and Abu Al-Ala’a Al-Ma‘ari who had relatives, servants, or volunteers writing out their poems line by line, Al-Baradouni structured his poems entirely in his memory, reviewed them, and modified them till the very last line. Then he asked someone to write them up as if Al-Baradouni was dictating from a book. This was the strategy he followed with every poem he published. There were times when he composed many poems and kept them in memory before they were fully written up at once. For example, in 1954 he was imprisoned for his daringly critical views and satirical poems. While in prison, he composed twenty-five poems that were not written up in full till he came out of prison. Compared to other Arab poets who were visually impaired, this remarkable ability is unique to Al-Baradouni. Abdullah Al-Baradouni’s inclination towards poetry emerged at the age of thirteen. It wasn’t until he was around eighteen that he started writing it. His favorite poets were Al-HuTay’ah, a pre-Islamic poet who also continued to write poetry during the early days of Islam, ibn Al-Rumi, Al-Khuza‘i, and ibn Sukkarah, popular poets during the Abbasid Caliphate. These poets are known for their highly satirical poetry and sharp language. Realizing the impact of selective language, Al-Baradouni enjoyed poems that had sharp criticism and harshly violent language. Likewise, in reading and reciting the Holy Quran, he carefully examined the verses that have highly expressive and figurative language. Influenced by the satiric poets he read and the harsh conditions of his childhood life, his poetry was a biting satire, for the most part. Although his poetic language and word choice were pertinent to his surroundings, he beautifully phrased his poems using Modern Standard Arabic. His poems were rich in symbolism and binary oppositions which made them intense and semantically powerful. Also, he was able to weave stories that reflected people’s worries, distresses, and harsh conditions into an enchanting poetic form. Although he was born and brought up in a tribal and traditional society, Al-Baradouni had modernistic views. Besides satire, his poetry was characterized by nationalistic romanticism and irony. His poems were structured in a way that suited contemporary form of Arabic poetry, while at the same time being loyal to the rhyme and scheme of classical Arabic poetry, a feat that his contemporaries were not able to accomplish. This made him one the greatest and most inspirational contemporary poets in the Arab world. Though visually impaired, Abdullah Al-Baradouni had an astonishing spiritual sagacity of what would happen in Yemen and the Arab World. His poems are full of prophetic metaphors and anecdotes. In a poem entitled أَبُو تَمَّام وَعُرُوبَةُ اليَوْم ‘Abu Tammam and the Arabness of Today’ he takingly portrayed the situation of the Arab World, sharply criticized Arab leaders, and ominously predicted the chaos of Arab spring. In another poem entitled صَنْعَاءُ وَالمَوْتُ والمِيْلادُ ‘Sana’a, Death, and Birth’, he foretold the fall of Sana’a and the seizure of power by the Houthis. In a third poem entitled صَنْعَاءُ وَالحُلْمُ وَالزَّمَان‘Sana’a, Dream, and Time’, he prophesied the Arab spring in Yemen against Saleh’s regime. His participation in Mosul Poetry Festival in 1971, which was his first trip ever outside Yemen, attained him popularity all over the Arab world. More precisely, it was his memorable poem ‘Abu Tamman and the Arabness of Today’ which he himself delivered during the festival. From then onwards, he regularly received special invitations and invitations to conferences and festivals from across the Arab World. Besides poetry, Abdullah Al-Baradouni was a columnist. He had a weekly column in the 26th of September, a state-owned, weekly newspaper. His column was entitled ‘issues of thought and literature.’ He also wrote a weekly column entitle ‘cultural affairs’ in Al-Thawra, a state-owned daily newspaper. He also wrote a monthly column for Ma’een monthly magazine. His writings were mainly about contemporary Arabic literature, the history of literature, the development of historical thought, and popular culture. He also worked for Sana’a radio, Yemen’s national radio station, from 1964 until he died in 1999. Besides being the head of the texts committee, he was the content writer for ‘the magazine of thought and literature’—a weekly program that lasted over thirty-five years. In 980, he was appointed the director of programs. Al-Baradouni, A. (1961). From the Land of Balqis. Al-Ma’rifa Publishing: Cairo. Al-Bardouni, A. (1967). In the Road of Dawn. Dar Al-Awda: Beirut. Al-Baradouni, A. (1970). The City of the Future. Dar Al-Awda: Beirut. Al-Baradouni, A. (1975). For My Eye Mother of Balqis. Damascus. Al-Baradouni, A. (1975). Departure to the Green Days. Damascus. Al-Baradouni, A. (1977). Smoky Faces in the Mirror of Night. Sawt Al-Khaleej: Kuwait. Al-Baradouni, A. (1979). An Era without Character. Dar Al-Awda: Beirut. Al-Baradouni, A. (1986). The Creatures of the Other (future) Yearning. Dar al-Kitab al-Arabi: Damascus. Al-Baradouni, A. (1988). A Sandy Translation for the Weddings of Dust. Dar al-Kitab al-Arabi: Damascus. Al-Baradouni, A. (1991). The Answer of All Eras. Dar al-Kitab al-Arabi: Damascus. Al-Baradouni, A. (1994). The Return of the Wise, ibn Zayed. Beirut. Baradouni, A. (1972). A Journey into the Poetry of Yemen: Old and New. Dar al-Hadith: Taiz. Baradouni, A. (1977). Yemeni Issues. Dar Ul-Andalus: Beirut. Baradouni, A. (1983). The Arts of Popular Poetry in Yemen. Dar al-Kitab al-Arabi: Damascus. Baradouni, A. (1988). Popular Culture: Experiences and Sayings. Dar Al-Maamoun: Egypt. Baradouni, A. (1991). Culture and Revolution in Yemen. Dar al-Kitab al-Arabi: Sana’a. Al-Baradouni, A. (1993). From the First Poem to the Last Bullet: A Study of Al-Zubairy’s Poetry and Life. Dar al-Hadatha Publishing. Egypt. Al-Baradouni, A. (1998). Incoherent Pieces. Sana’a. Regarded as one of the greatest Arab poets and hailed as a masterpiece of poetic prophecy, Abdullah Al-Baradouni died on August 30, 1999. May his soul rest in peace, amen!